Vision-Gard Screens are a new addition to the Alspec® range of screening options. Vision-Gard screens not only secure your home but also provide a degree of privacy from people outside your home looking in. 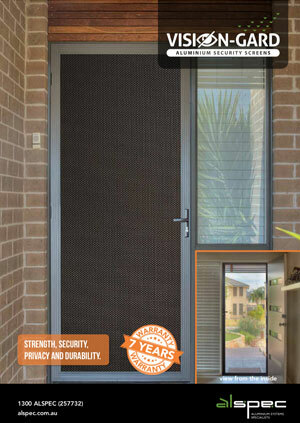 Vision-Gard screens provide security, privacy and strength, as well as being corrosion resistant and looking great. Vision-Gard Screens utilise a strong (1.6mm thick) aluminium sheet that is perforated and powder coated in Australia to exacting standards. This mesh works by limiting the field of vision for people on the outside looking in. Vision-Gard works if there is correct lighting allowing a person on the inside to see outside and not be seen from the visitor’s side. The resulting screen is strong, extremely resistant to corrosion and provides excellent clarity of vision from the inside looking out. Alspec® now offers the complete range of screening systems from our top of the range Invisi-Gard® 316 Stainless Steel Security Screens, through to Alu-Gard®, Federation Cast Panels®, Alu-Grille® Diamond Grilles, Vision-Gard one way vision security screen, fibreglass and aluminium insect screen and all the associated accessories. For a history of great service and quality built products when considering an aluminium screen door system, there’s only one place that has all the solutions - Alspec®.